Doctor Albert W. was a surgeon with the 14th Kansas Volunteer Cavalry Regiment, enlisting in August of 1863 and honorably discharged on June 25th 1865 after 22 months. A villainous saloon-keeper, whose nefarious business had been injured by the bold stand which the Doctor took against the evil and for the good of humanity, brutally murdered him on September 12, 1883. He married (1) THURSEY L. HARMON on Jan. 17, 1861 in McDonald County, Missouri. Their children: Lincoln Curtice "Linc", Emma Frances, Charles W. Blair, Thursey Lillian "Lillie", Albert William, and Stella J. He married (2) LAURA VICTORIA YONCE on Jan. 1, 1881 in McDonald County, Missouri. Their children; Wallace Carroll, and Henry Edward "Harry"
by T. S. Lundberg (Sternberg), a contributing member. 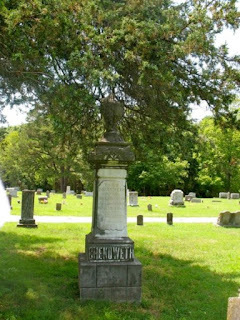 Dr. Albert W. Chenoweth (deceased) was born in Chillicothe, Ohio, on October 15, 1835. His father was Henry S. Chenoweth, who is now deceased. Dr. Albert W. Chenoweth was liberally educated in Circleville University, Ohio, and came with his parents to Springfield, Mo., in 1851. They resided in Springfield six years, and in Newton County one year, and came to Pineville in 1858. The subject of this sketch graduated from the Missouri Medical College, of St. Louis in 1858, and from the St. Louis Medical College in March, 1865. He gained a thorough knowledge of his profession, which he afterwards practiced so successfully. On January 17,1861, he was united in marriage with Thursey, a daughter of Mark Harmon, now deceased. Mrs. Chenoweth died on February 9, 1880, leaving six children, namely: Dr. L. Curtis, Emma, Charles, Lillie, Albert and Stella. Dr. Chenoweth married again on January 9, 1881, choosing for his wife Laura V. Yonce, a daughter of James E. Yonce (deceased). To this union have been born two children, Wallace and Henry. The Doctor was one of the most prominent and useful citizens of Pineville, always taking a deep interest in anything that was for the public welfare. He was a devout Christian, an earnest temperance worker and a member of the Methodist Episcopal Church South. His zeal for temperance cost him his life. A villainous saloon-keeper, whose nefarious business had been injured by the bold stand which the doctor took against the evil and for the good of humanity, brutally murdered him on September 12, 1883. The enraged citizens, seeing that the murderer was about to escape the punishment he deserved through some technicality, organized a company which took him from the jail at Neosho and shot him. For many years the Doctor was a Mason, and stood high in that ancient order. Prior to the Civil War he was a Democrat in politics, but afterward acted with the liberal Republicans. 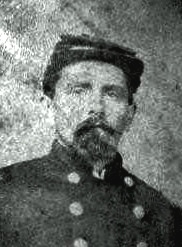 During the war, or from 1863 to 1865, he served in the Federal army, as surgeon of the Fourteenth Kansas Volunteer Cavalry. From 1866 to 1870 he served as county and circuit clerk for McDonald County. The county, recognizing his ability as a public officer, elected him to the Thirtieth General Assembly of Missouri in 1878 which position he filled in the most satisfactory manner. Dr. Chenoweth has edited and published several different papers in the county. Click on author's byline for bio and list of other works published by Pencil Stubs Online.The Memorial Marker (see below) for Dr. Albert White Chenoweth and first wife Thursey was provided Find A Grave Memorial website on 20 Jun 2011 by Diane Cobb, a contributing member.